The Dark Knight's Christopher Nolan: Writer. Filmmaker. Game Designer? Director Christopher Nolan builds a lot of rules into his movies. From The Prestige to Memento to The Dark Knight, each film is an intricately created network of systems and balances, shapes and lines set in motion against one another. It can be exhilarating, but it can be exhausting. It's certainly distinctive. The New Yorker's James Verini has written a smart critique of Nolans films in which he discusses their gamelike quality in a far-reaching if not terribly in-depth degree. It's an interesting look at a man whose films can feel overly structured, bracing in their answer-obsessed maleness. I would argue that a new kind of movie came into being with Ledger's Joker. Let's call it the algorithmic action picture. Viewing "The Dark Knight," and its follow-up, "Inception," you feel as though you haven't pressed "play" on a movie, but rather "start" on a game console, or that you've instructed a computer program to run and are watching its functions. These movies are so frenetically informative and their rules take up so much bandwidth that the screen seems to contain not mise-en-scène but "gameplay," that interactive dance between player and video game. Verini spends much of his time talking about Inception, writing that it took him a while to realize that the movie suffers from "male-answer syndrome." It's both exhausting and oddly adolescent. I'd be willing to bet that mining the script for data would reveal around 95% of the film's dialogue to be exposition. It's no wonder that even though it runs for nearly two and a half hours, we never get to know any of the supporting characters - no one has time for that! There's far too much to explain! I've softened somewhat on Inception since I wrote that—subsequent viewings have laid the film's rules bare for me, and I've come to enjoy the movie more for what it is than what I wished it had been. And I still very much like Memento and The Prestige, as well as most of The Dark Knight. 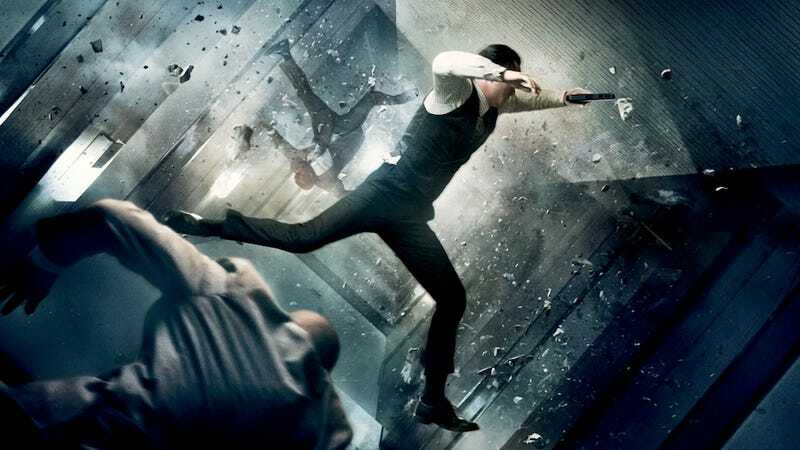 Inception certainly felt like the film that stepped the farthest into a pure world of rules—Nolan's other films have played with a similar challenge in different ways. I haven't seen The Dark Knight Rises yet, but I'm looking forward to it. His films may not always be my favorite thing, but I have grown enjoy trying to wrap my brain around Nolan's intricate contraptions.